I’m writing this article as a software developer. That said, I’m aiming it at anyone involved in making a decision around wholesale eCommerce. 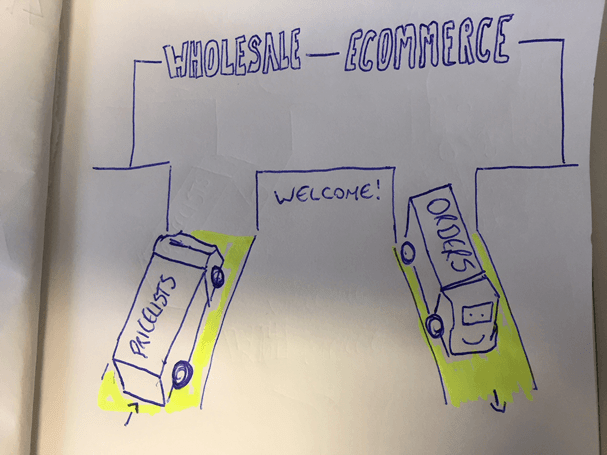 If you have asked the question ‘How will this wholesale eCommerce work with our existing systems?’, this article is for you. If the language goes nerdy/too technical at any stage, bear with it. It will definitely help to make your journey of planning and deploying wholesale eCommerce easier. The most important step in integrating any two software systems is planning. You need to know what information to send into your wholesale eCommerce. And you most certainly need to know what info you want to get back into your ERP. To provide your trade customers with convenient way to get real-time product information, including the up-to-date pricelist, anytime they need it. To accept online orders and order information like labelling details, signatures, acceptance of T&Cs, payment method etc. For simplicity’s sake in this article, I’m assuming that you are happy to update your products information like photos, etc manually. To upload product photos etc, your wholesale team logs in to the wholesale eCommerce CMS (content management system), similar to how you do on your facebook page etc. Of course sending product information from somewhere else can also be automated. So, let’s look at price lists and orders. Now, let’s say you use your ERP system to update your price lists. Furthermore, you don’t want to update price lists more than once. That would take extra time and effort. It could possibly lead to mistakes. Your orders placed online need to feed back smoothly into your ERP and other systems in order for the production and distribution team to take the appropriate actions. This needs to happen in real-time when the order is placed. As a result, you need to automatically ‘feed’ your wholesale eCommerce system with the updated price lists and you need to ‘feed’ your ERP and other systems with the orders placed online, along with relevant order details. Let’s think about price lists first. Your ERP system probably has a few ways to export them automatically. Maybe this is via a .csv file or another type of file that’s easy for a computer to read. Or maybe your ERP system has an API that can send and receive information from other systems. So now that you have a way of sending price lists, brilliant! Next, the wholesale eCommerce system needs to import the price list using a simple import tool. This import tool’s job is: Whenever a pricelist comes in for X customer or customer group, match the price list information product by product, and import the new prices. Simple and extremely tedious for us humans if it happens too often, so it’s definitely something worth considering automating it. While this is an article about integration, it’s always worth looking at the costs and benefits of different ways to do a task. 2. how much time and effort it takes to do. It is worth remembering that wholesale eCommerce systems like iStockist gives you options to ‘copy’ or clone a price list. In this way you can update a new based on an old one. So there are often simple alternatives to integration. This is especially true if your price lists usually only require minor changes. Or if they don’t get updated that regularly. Either way, starting with a person doing the work is a great way to assess this. So now that we have worked out how to manage price lists, time to look at orders. Let us see how we get the orders out of the wholesale eCommerce system and back into your ERP. Well, it’s pretty much like price lists, except in reverse. If you have at least one way to get the order information out of the wholesale eCommerce system, and one way to get the order information into your ERP system, you are golden. The first key step is to find out what methods of importing orders works best for your ERP system. Is via EDI, csv or an API. The next step is to get that information out of the wholesale eCommerce system. Good idea to get in touch with your wholesale eCommerce supplier on this. iStockist exports via API as JSON by default. We also happily export to the format you need. The key now is transforming the order information that the wholesale eCommerce system send, into a format that your ERP can read. You will need import tool for importing orders into your ERP. This import tool might already exist as part of your ERP solution, you might build it internally, you might ask your ERP or wholesale eCommerce supplier to assist you with it. There’s a good chance that one or both may already have a ready-made solution that simply need to be configured for you. There are also plenty of third party integration specialists and platforms, like Mulesoft that can help transform the order information into the format you need it, using ready-made easily-configurable solutions. You now have an overview of the information you need to plan the integration of your ERP with wholesale eCommerce. Do I need an integration yet? Should I first get my people working with both systems until there’s sufficient work on managing price lists and orders to justify an integration? How can I automatically export price lists out of my ERP? What format is it in? (e.g common formats are via .csv, via API as JSON, via API as XML). Does my wholesale eCommerce system have a simple way to import price lists? Who’s going to set up and manage the import tool? (Often this involves a combination of to-dos for the business + wholesale eCommerce supplier). How can I export orders from my wholesale eCommerce system? (ask your wholesale eCommerce supplier. iStockist exports via API as JSON by default. We also happily export to the format you need). Does my ERP have a simple way to import orders? Who’s going to set up and manage the import tool? (Usually to set this up this, there’s combination of to-dos for the business, working with either the ERP supplier, or the wholesale eCommerce supplier, or both). If you plan to integrate wholesale eCommerce and ERP, good luck and hope this article helps you. If you have any questions don’t hesitate to get in touch. This is part Three in our helpful guide to Planning and deploying wholesale eCommerce.